Sharing stories and getting the job done — ThoughtFamer is making Cummins a better place to work. The 830 employees at Cummins Western Canada (CWC) sell, service and support the massive diesel engines that Cummins is famous for. With 14 branches from British Columbia to Ontario, CWC employees can be found performing maintenance on hospital back-up generators; replacing parts on massive earth-movers at remote mining sites; or calibrating the engines that power off-shore oil rigs. Like most companies, CWC would like to capture and codify the wealth of knowledge that exists in their employees’ heads. But unlike most companies, CWC has chosen a surprisingly pragmatic way of doing so: stories. Get employees to tell their stories. ThoughtFarmer provided CWC with an out-of-the-box storytelling platform, along with a Professional Services team for installation, configuration and training. CWC’s ThoughtFarmer intranet launched in October 2012 and was an instant hit. Within hours they had received their first employee story. It was submitted by the Customer Assistance Center in honor of their one-year anniversary, and it was the first of many. “We were hoping for 2 real stories a month. Now we’re averaging 3 a week!” says Kubota. The “Our Voice” section of the intranet, which includes Employee Blogs and Community Forums, is one of the most frequently accessed sections of the site. Stories receive dozens of comments from employees. 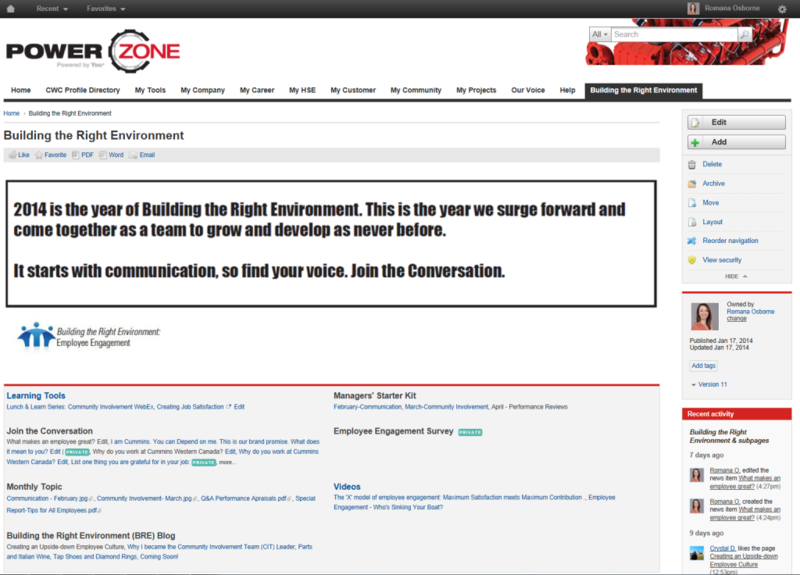 CWC’s ThoughtFarmer intranet, named “PowerZone,” goes beyond storytelling. Their team knew that for successful adoption they needed to draw people in by adding essential tools. “People are using ThoughtFarmer to do their job,” Osborne says. “People are using ThoughtFarmer to do their job,” Osborne says. 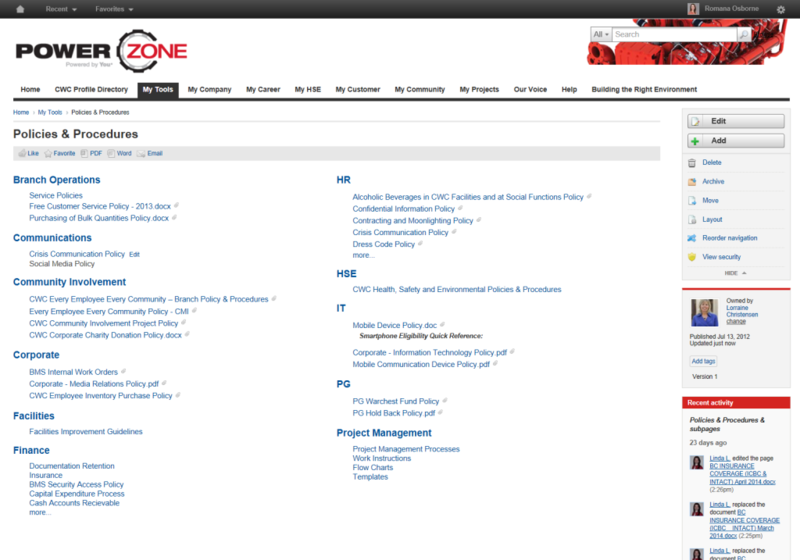 For example, all policies and forms are now on their intranet. A section on employee health and safety is used by employees to complete mandatory safety tasks. As a result, over 70% of employees are accessing ThoughtFarmer daily, compared to 29% for the old one-way intranet it replaced. The high adoption is especially impressive for an organization where many employees are working on shop floors and not in front of computers all day. Osborne’s efforts to educate users and to make ThoughtFarmer a safe and welcoming environment for participation have paid off. As users see that their opinions and voice are respected, they become more active on the site. Jessica Nuttall, Cummins’ Health and Safety Coordinator, manages the extensive content in the health and safety section of their intranet. For North American Occupational Safety and Health week, she used ThoughtFarmer to generate awareness of the vital work they do. The initiative had the highest participation rates of anything they’ve ever done on the intranet. At the end, they made a calendar out of the submissions and awarded prizes to all of the kids. 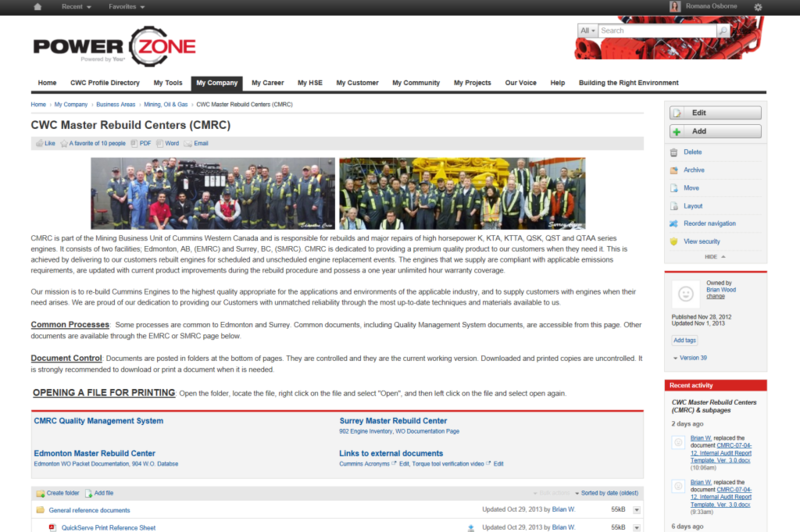 But the biggest payoff was in awareness and recognition, both for the safety department and the important work they do, and of how content and community can come together in a single spot on the intranet. 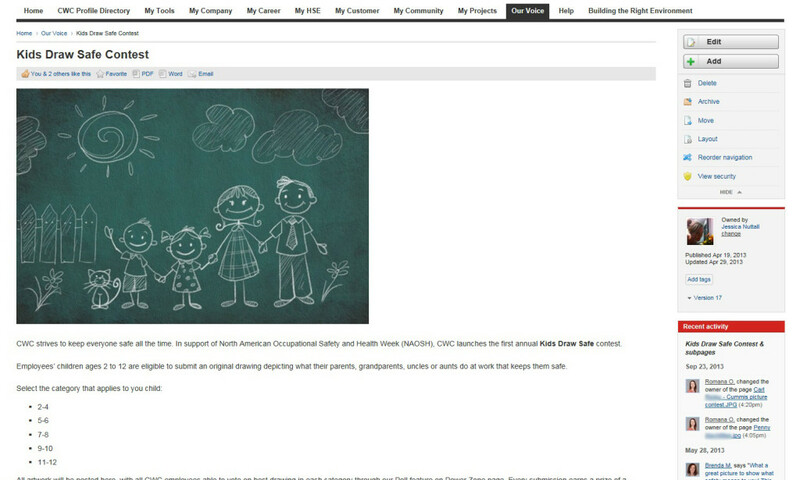 Cummins is focusing 2014 on Employee Engagement and “Building the Right Environment.” Their ThoughtFarmer intranet plays a key role in that initiative.